Whilst it may be loathed by dance aficionados and purists (though is there anything self-proclaimed ‘purists’ don’t loathe? ), there’s no denying the impact Strictly Come Dancing has had in once again returning ballroom dancing and its ilk back onto the collective consciousness. 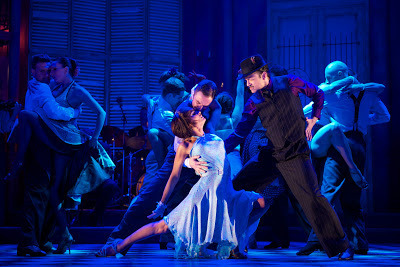 The latest ripple of this cultural proliferation comes in the form of the rather brilliant Midnight Tango, a wonderfully confident and focused piece of dance theatre which shares more in common with the likes of silent cinema of the early 20th Century than it does the conventional musicals and dramas currently doing the rounds on the boards. 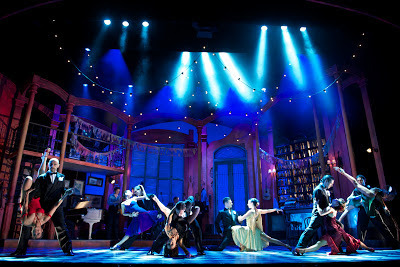 It’s a deliciously vivid and distinctive piece, a wonderful night’s entertainment even for those such as myself who are not ardent dance enthusiasts or viewers of the show, and a real celebration of the technique, artistry and versatility of dance as a means to tell a story, convey character and evoke mood. And, of course, the Strictly ties are more than present, headlined as it is by the ever popular Vincent Simone and Flavia Cacace, runner-up and winner of last years series of the show respectively, who more than demonstrate the merit behind their popularity. Set solely in a beautifully realised downtown Buenos Aires bar complete, naturally, with a live micro orchestra, the show thankfully ensures dance takes front and centre, practically devoid of any dialogue aside from the occasional reactionary utterance. 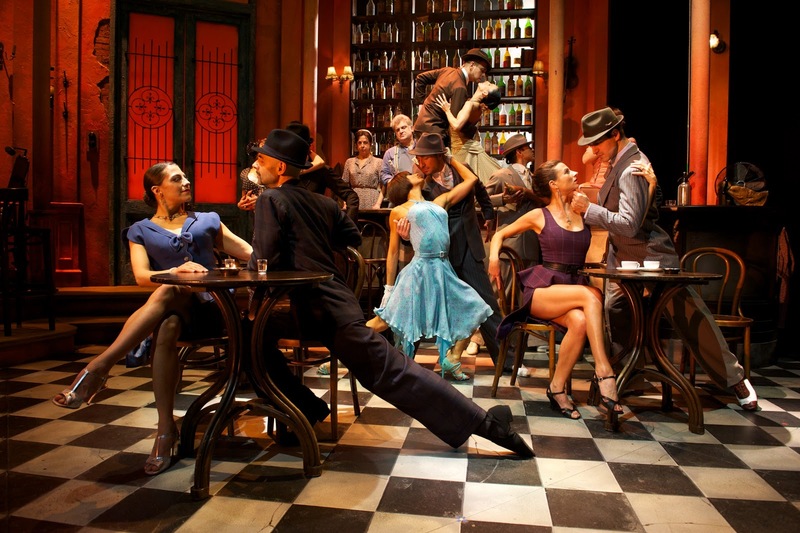 Although the draw here is clearly the choreography, Midnight Tango actually does an effective and engaging job of conveying two central narrative strands that are played throughout - the first being a love triangle of sorts where two frequenters of the bar vie for the attention and passions of Cacace’s Sofia, and the second a more comedic look at the marriage and dynamic between the two elder owners of the bar, Carlos and Rosa. It’s simple and relatively predictable fare, but it’s ease is what makes it so accessible and ensures the material lends itself so beautifully to a masterfully eclectic and stunningly executed bricolage of dance, and some wonderfully endearing and entertaining physical comedy with Carlos and Rosa in particular. Around these two stories lives and breathes the vibrant and convincing Latino locale - a veritable sense of the Argentine, and even in the midst of the most captivating dance sets the stage is usually dotted with characters, locals and regulars convincingly going about their own business; lesser stories and isolated vignettes that really sell a palpable sense of time and place. Given the (literally) world class standard of talent assembled for the show, it is unsurprising to say that the shows raison d’etre is diverse, enthralling and regularly dazzling. Thankfully, there’s no wire-assisted flights of fancy or any of the other more egregious additions the BBC series and it’s ITV ice-skating counterpart seem so fond of - everything here is pure, disciplined physicality and a delicious, breathtaking demonstration of it indeed. Nuances of character, bombastic invocations of rage, showcases of passion both tender yet forceful, intricate and powerful - this is a varied yet distinctive showcase of dance at it’s most illustrative, characterful and alluring, an opulent, sensual and commanding array. The authenticity filters through to practically all elements of the show - newspapers are genuine set alight with real flame, bottles are smashed, chairs thrown across and characters adorn tabletops and bars with no safety or restraint - as with the dancing everything looks and feels real, raw and pure, and the overall experience is made all the more satisfying and exciting by being so daring, tangible and devoid of trickery. Simone and Cacace give expectedly accomplished turns, some of their latter numbers in particular being astonishingly technical and faultlessly executed. Executing rumbas, tangos and the like with aplomb, they exude an undeniable chemistry and charisma, and their 18 year partnership has clearly wrought a confidence and physical harmony between the two that is irresistible to watch. Given their history and one another’s presence, they rise far beyond the Strictly status quo - released uninhibited as they are from trainee Z-listers and instead able to spotlight Cacace’s fiery, tense precision and extraordinarily nimble, flexible twists and contorts and Simone’s fluid, elegant mix of strength and grace. Cacace gets most of the showier moments, but the pair compliment one another perfectly, with Simone being the assured enabler to her more exotic and showier dance artistry. And they are admirably met by the aforementioned company of world-class dance talent who aren’t without some show-stopping and enticing moves of their own. Tricia Deighton and Anthony Renshaw provide much of the shows heart and added audience appeal as Rosa and Carlos, giving Midnight Tango a slightly different and much appreciated extra dimension. Both give accomplished comedic turns and are a genuine delight in their roles (as derivative as they may be), lending the show a considerable dose of feel-good to compliment the passion, steam and spectacle. Midnight Tango was something of an unexpected surprise. It is no doubt capitalising on it’s Strictly affiliations to put people in the seats, yet rightly so. What is re-assuring and impressive is that the shows creatives have not rested on their laurels in having the big sell of Flavia and Vincent, but rather crafted a distinctive and glorious celebration of dance, particular of the South America flavour, encapsulated in a characterful, distinctive and wholly authentic and believable show that pretty much seems to have judged everything right. It avoids being overlong or repetitive, and crucially it’s catalogue of dance is broad yet defined, and all performed with effortless skill and captivating vigour. Fans of Strictly will no doubt find plenty to adore in just witnessing two of the shows most prolific and capable talents giving it their all, but that is far from the only thing the show has to it’s credit. And even those purists or Strictly naysayers will have a hard time denying the scintillating allure, feel-good warmth and aesthetic bedazzlement the show and it’s exemplary team of talent offer. MIDNIGHT TANGO is running at the New Alexandra Theatre, Birmingham from Tuesday 7 May to Saturday 11 May 2013. 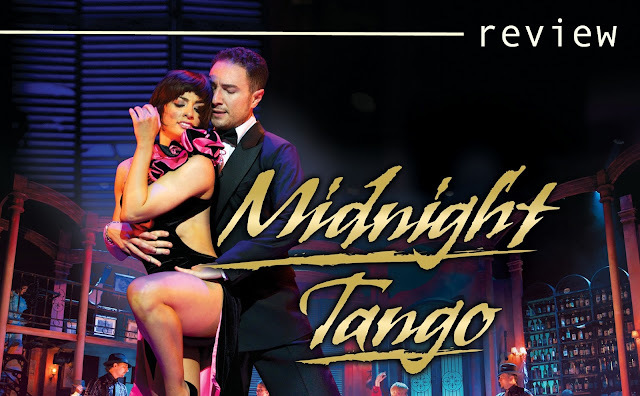 Press tickets for this performance of Midnight Tango were provided courtesy of The New Alexandra Theatre, Birmingham directly. (A)musings Media gratefully acknowledges their generous invitation.